A new South African political party wants the government to expel all foreigners, claiming they bring crime into the country and are responsible for high unemployment. While it's unlikely the African Basic Movement party will win big in next year's general elections, its emergence is a sign, analysts say, that the global wave of nationalist, populist politics has come to the Rainbow Nation. Party leader Thembelani Ngubane says his party, which he started last year, has gained tens of thousands of members and signatories to its petition to deport all foreigners by year’s end. Those numbers could not be verified. The party recently registered to compete in next year’s elections, but critics question whether its platform adheres to South Africa’s progressive, inclusive constitution, and whether the party's position leans dangerously towards hate speech, which is illegal in South Africa. About two million foreign nationals live in South Africa, most from neighboring countries such as Zimbabwe, according to the most recent census. However, the actual number, which includes undocumented residents, is thought to be higher. This rise in xenophobic politics is extremely worrying, says Sharon Ekambaram, who heads the refugee and migrant rights program for Lawyers for Human Rights. She warns it could spur yet another outburst of xenophobic violence, given that South Africa periodically sees such violent, deadly clashes between disillusioned citizens and foreign nationals. “I can’t even articulate how dangerous this is for our democracy,” she said, talking about the emergence of Ngubane's party. “This is clearly a group that is racist, they’re xenophobic.… And I don’t think there’s a place for those kinds of people in our country. And I think that it’s serious that the electoral commission needs to investigate, if they have actually registered as a political party, whether that is constitutional for a party, because it makes space for someone who’s a fascist, or a racist to form a party." 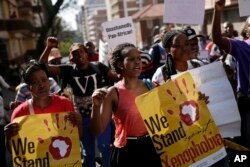 FILE - People rally during a march against xenophobia, in downtown Johannesburg, South Africa, 2015. Anti-foreigner sentiments have been on the rise in the country which, according to most recent data, is home to some two million foreign nationals. Moreover, Ekambaram adds, the party's premises are flawed: researchers have found that foreign nationals are often job creators, and are not disproportionately responsible for violent crime. Political analyst Ralph Mathekga says he, too, is concerned, but not that the ABM will beat the juggernaut ruling African National Congress at the polls. What worries him, he says, is that their extreme views are opening the window for other nationalist beliefs to enter the mainstream. Mathekga believes the ANC’s numerous corruption scandals and its inability to reduce unemployment and poverty during its two decades in power also make it easier to challenge them. Mathekga added the global rise of populist politics makes it easier for groups like the ABM to emerge. Pointing to the United States, ABM leader Ngubane praises U.S. President Donald Trump's “zero-tolerance” illegal immigration policy, saying he shares the American leader's views.